Unlike stock exchanges, crypto exchanges are platforms to sell/buy/trade cryptocurrencies. The purpose and motive of an exchange is to provide fair orderly opportunity to anyone who wishes to buy or sell cryptocurrencies. In turn exchanges levy a marginal fee on the transaction towards their revenue. Cryptocurrencies had a great run in 2017 and seem to be revolutionizing the world of finance and banking. There are different crypto exchanges available in the market. They are different in many ways, some of them offer incredible amount of trading pairs, some have crypto/fiat currency trading pairs and some don’t, in some of the exchanges you can deposit your fiat money and trade cryptocurrencies with no fee whatsoever and in others you’ll end up paying more than 4% or so. Binance is a popular exchange for trading crypto to crypto. No fiat currency onramp available, even though you can trade USDT pairs, which is a cryptocurrency made to simulate US dollar with almost static conversiopn rate of 1USDT equals 1USD. It is originated from China and offers all features to the investors across the world. Apart from the offerings, it also levies a small amount of trading fee. 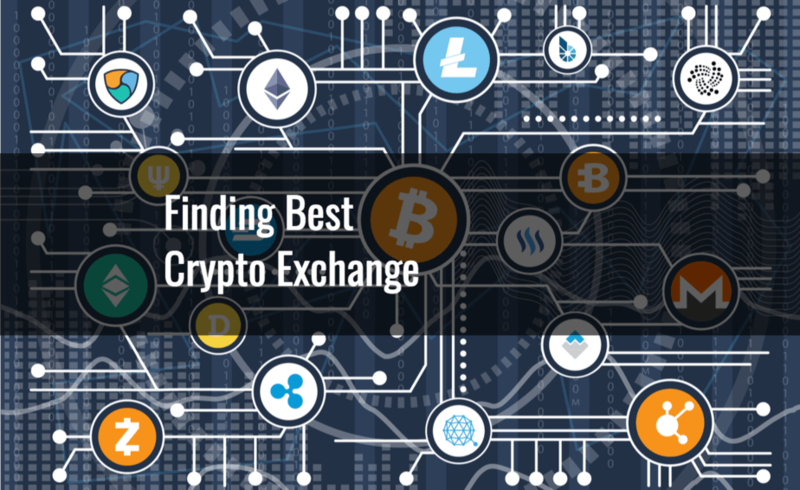 While, the exchange is relatively new (like anything else in crypto), it has grown enough to be recognized as one of the best crypto exchanges as of today. It has a large number of Bitcoin, Ethereum and tether pairing. This exchange offers its own coin called BNB, Binance Coin which can be traded in this exchange with special discounts before trading in other exchanges. The fee levied by the exchange is 0.1% of the transaction which is marginal. Trade can be conducted through their website as well as mobile App. Its one of the most professional exchanges in the market today. At present they have stopped opening new small accounts, instead servicing all existing accounts well. They consider security as their priority after the hack in the year 2016. The platform is full of great features and waiting to open an account is worth it. The features include best set of orders, a trailing stop loss, fiat support and margin trading. Bitfinex also is good for its customizable interface and in browser notifications. It is appropriate for traders seeking top notch features and levies a moderate fee on the transactions. It is reputed and well-known crypto exchange supports investors from 32 countries from North America to Europe, United Kingdom, Australia and Asia. The exchange is friendlier to the new users and traditional users looking to invest in cryptocurrencies. Bitcoin, Bitcoin cash, Ethereum and Litecoin are available. Payments can be made with ACH bank transfer or with a credit card but with a higher fee. Being different from the traditional exchanges, the trader has to deposit fiat money into exchange before placing a purchase order. One of the most reputable crypto exchanges in the world, Poloniex is the choice of traders looking for a fair selection of altcoins. The main benefit of this exchange is that the traders get the option to short coins and trade with margin. Not all crypto currencies are available for margin trading, but it is a rare feature and is not available in all the crypto exchanges today. The software and user interface are not that great but provides enough tools for analysis and lots of information. This exchange id great for those who are looking for margin trading and altcoins. This exchange is based out of San Francisco. Highest volumes of trade have been observed from European Countries in this exchange. It also supports the rarest feature of margin trading and trading in altcoins. Euro, US dollars, Japanese Yen and Canadian Dollars, fiat currencies can be utilized in the exchange after bank wire deposits. Only demerit in this exchange is that the user interface is not that aggressive. It is good for the traders that are looking for a complete set of features. This exchange is suitable for traders who wish to transact in a trustworthy and easy to use platform. It makes buying and selling cryptocurrency for the inexperienced traders easy. One of the unique features available in this exchange is instant buy or sell, comes very handy to the traders. Credit and debit cards are accepted in the exchange with a seven percent fee. It also provides high liquidity and quick fulfillment of the orders. The trade can be carried out through its website as well as through the mobile app. The fees set on the basis of volume of 30 days for all pairs and differs for market takers and market makers. Just to clarify, you’re a market taker if you place an order that will be executed immediately at best price available, you’re basically taking liquidity out of the market, you’re market maker if you place an order with a preset price at which there is no counterparty available at the moment to execute transaction. So it’s pretty common practice on exchanges that market makers don’t usually pay a fee, while market takers do. It is a US based crypto exchange and allows trading in large numbers of trading pairs. Almost all cryptocurrencies are traded on this platform. This crypto exchange is highly reliable and believes in compliance of all regulations in United States of America. It trades the largest volumes of Bitcoin globally. A trader is allowed to decide the trading rates with a service fee of 0.25%. The verification process on Bittrex is very quick and thus it saves a lot of time. The exchange supports two types of accounts such as Basic and Advanced with limits of withdrawal up to 3 BTC per day to 100 BTC per day. For registration, one has to log in with their email but for the purpose of withdrawal, KYC (know your customer) has to be furnished. KuCoin has roots in China. After a crack down by the authorities, it has moved to the neighboring Hong Kong. It attained a good amount of growth through its affiliate program. It is reputed for its early adoption of cryptocurrencies enabling long term holding of cryptos. The crypto exchange provides hassle free trading and easy along with a different crypto currency called Dragon Chain, IOTA etc. The exchange also allows you to operate through its mobile App for trading. The trading operation can start initially with the deposit of crypto currency. A fee of 0.1% per transaction is levied from traders for transactions on this platform. This crypto exchange serves exclusively for Koreans and is well recognized for large volumes of trade. It offers support for almost all big coins including coins like Ripple and Monero. The user interface of this exchange is very simple but effective for trading in various cryptocurrencies. It does not have charts and price history to show and hence not preferable for traders seeking to do trading for the day transactions. It is great for those who have an access to the Korean currency “won” and looking for a simple place to trade in cryptocurrencies. This exchange is the second largest crypto exchange in South Korea. It is said to be the first crypto exchange to trade in Ethereum and Korean won. At present the currencies accepted in this exchange are Korean won, Ethereum, Ethereum Classic, Bitcoin, Bitcoin Cash, Ripple, Qtum and Litecoin. This exchange is suitable for the traders based out of South Korea at present.